MOSUL, Iraq — A new video released by the barbaric Islamic group ISIS, which identifies as the Islamic State of Iraq and Syria, shows the terror organization burning a pile of Bibles and other religious books. Some of the books are in boxes and the others that are visible have a cross on the front with Arabic text. 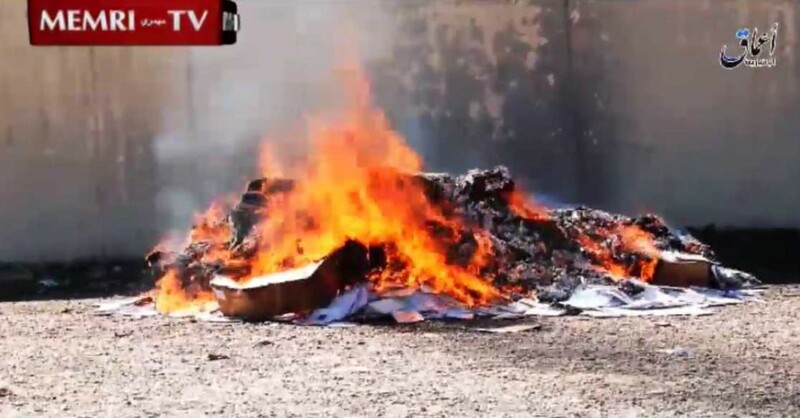 “This video is the first specifically showing the burning of Christian books,” the Jihad and Terrorism Threat Monitor team for the Middle East Media Research Institute (MEMRI) said in a statement. Earlier this week, the U.S. House of Representatives voted 393-3 in favor of a resolution to declare that ISIS is committing genocide against Christians and other religions and minority groups in the Middle East. “What is happening in Iraq and Syria is a deliberate, systematic targeting of religious and ethnic minorities. Today, the House unanimously voted to call ISIS’s atrocities what they are: a genocide. We also will continue to offer our prayers for the persecuted,” House Speaker Paul Ryan said in a statement. As previously reported, last October, the U.S. Department of State released its annual International Religious Freedom Report, finding that the greatest persecutors of Christians and other groups worldwide were Islamic terror groups like ISIS and Boko Haram. “In Mosul, Iraq and nearby towns, shortly after the takeover of the area by militants of the Islamic State of Iraq and the Levant (ISIL), Christians [and others] who had been given the choice to convert, pay a ruinous tax, or die, gathered their families and what few possessions they could carry, and sought all possible means to escape,” the executive summary of the report reads. “It has forcibly displaced hundreds of thousands of people, conducted mass executions, and kidnapped, sold, enslaved, raped and/or forcibly converted thousands of women and children—all on the grounds that these people stand in opposition to ISIL’s religious dogma,” it continues. Open Doors’ 2016 World Watch List also ranked Iraq the second most dangerous place to live as a Christian, next to North Korea.